Oh, my sewing friends, just wait until you see what my mother-in-law found in her basement recently. My level of excitement will surely give it away. A bonanza of notions, buttons, fabric, and patterns! Deb's (my MIL) mother was a talented home seamstress. She made clothes for herself, her three daughters, and her three grandsons. I've seen photographs of her lovely work: a wedding gown, a light blue long coat, Madmen dresses. She also did general DIY like headboards and furniture upcycling when this was just called "making-do" - necessary activities in the home of a state policeman and part-time switchboard operator. 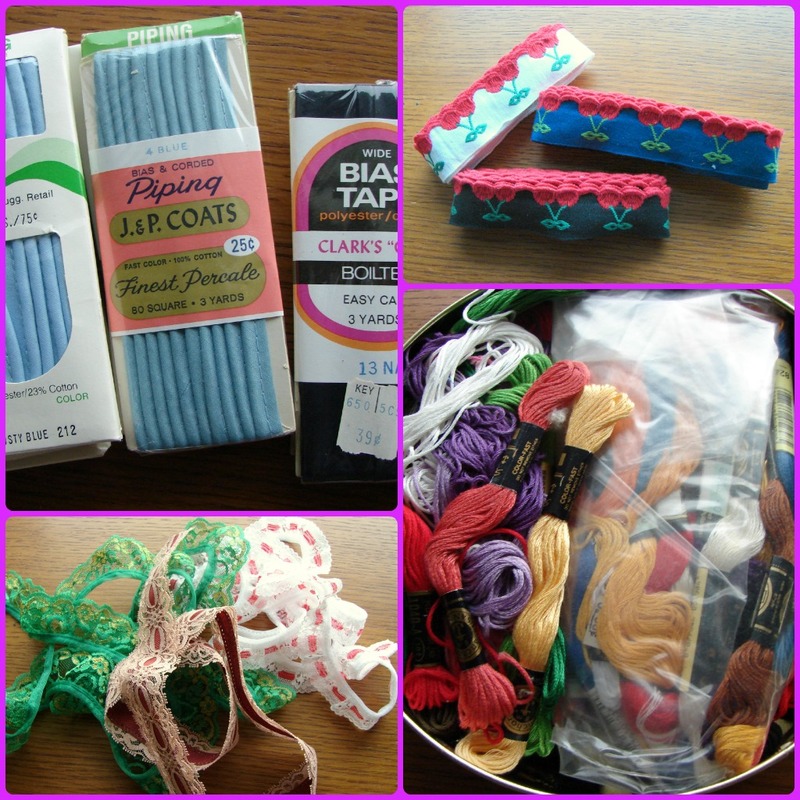 Deb has been clearing out her basement in preparation for some remodeling, and she came across a cupboard full of sewing related items. Some are from her own work sewing clothes for her three boys, but a lot is leftover from her mother's stash. Part of what's fun about receiving all these items is imagining what Deb's mother was going to make with them. For instance, we found five packets of light blue piping. Five?? Did she just like the color or was there a pattern that called for that many? Maybe a dress with coat to match? Or matching dresses for her three daughters? And take a look at that cheery cherry trim (top right)! I can't wait to use it on something for girls, and can't you just see the black one trimming a black sundress for me? And, thaks to Grandma Bobber (she didn't like her own name - Gladys - so everyone called her by her nickname), I will likely never need to buy embroidery thread ever again. Buttons are one of my favorite thrift store finds. It's like discovering a box of jewels or a bag of gold coins. I don't know why this is - maybe it's because a tin of buttons represents so many potential projects, a richness of opportunity. I also love the connection to the past that these items give me. If I make a dress for my girls and use buttons from their great-grandma's stash, they get to touch the memory of her in a small way. When I sew a blouse using one of her patterns, I get to finish a project that she perhaps planned but never had time to complete. Sometimes it's better to start a journey without the instruction manual. But I'm glad to have it now! Have any of you found a treasure in an attic or basement? What was it? 2 comments on "Basement Treasure"
So cool! The buttons are FAB!!! What you gonna do with all that piping??? Lucky You !making me feel 'J' ;) LOL!